Blockbuster, a relic of America's once vibrant VHS culture, is nearly extinct. Two of the last three remaining outposts of the once ubiquitous video store are closing down in Alaska, where they've been hanging by a thread for years, despite efforts from John Oliver to keep one of them afloat with steady donations of Russell Crowe memorabilia. The inevitable shutterings are set for Monday, although both stores -- located in Fairbanks and Anchorage -- will sell off their remaining inventories from Tuesday through the end of August, reports Deadline. 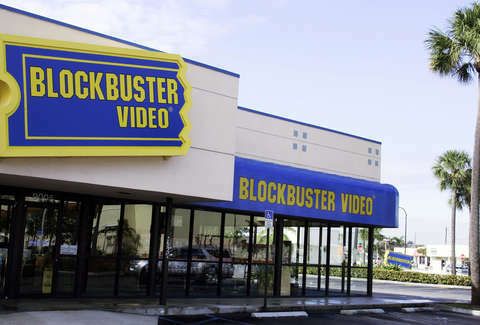 After that, Blockbuster's last vestige will be a humble storefront in Bend, Oregon. The retailer had remained more essential in Alaska than it had in other states, owing to the limited accessibility of high speed internet in the state. It's a problem that's seen connectivity in rural areas lag in comparison to more populous regions in the country, rendering Netflix a kind of luxury, rather than a standard form of entertainment. This is why John Oliver of HBO's Last Week Tonight decided to get involved, heaping spotlight on the Anchorage Blockbuster by sending it ephemera from old Russell Crowe movies. Oliver and company bought a glut of old Crowe memorabilia that the star sold off in an auction, and then promptly sent the spoils -- including a $7,000 jockstrap worn by Crowe in Cinderella Man -- north to the Alaskan Blockbuster. Although Blockbuster declared bankruptcy in 2010, a smattering of privately owned stores had remained throughout Alaska in the wake of its financial travails. The Anchorage Daily News reports that 13 stores statewide in 2013 had dwindled down to nine by 2016, with the final two meeting their demise this week. Now, with its numbers shaved down to a lonely store in the Pacific Northwest, John Oliver's jockstrap relief efforts have probably never been more vital.